Results from events held in South Australia. The first winner in the S. A. State Singles in 2014, was Rodney Egge and he doesn’t need to prove anything, indeed quite the opposite, he was instrumental in the way we accept Armed Bowling today. Since then, however it seems you have to prove your worth by going back to back! Congratulations to Phil Sanders on his back to back win. Well done John Maher, runner up (your turn next?). Sincere thanks to Linda Carter for her report and to Winston Longbottom of the “South Australian Bowlers Arm Players Association” (SABAPA) for sharing it with us. “On on Monday 19th March Kapunda Bowling Club hosted the annual Armed Bowlers Tournament, with 50 armed bowlers travelling from as far as Broken Hill, Yorke Peninsular, Fleurieu Peninsular as well as from the Adelaide clubs and our local Barossa clubs. This is the only tournament specifically for those bowlers using a mechanical devise. These bowlers would be lost to the sport without this aid. A Great day was had by all participants who are looking forward to coming back next year. Thanks to the Kapunda Bowling Club members who provided lunch, bar staff, and greens preparation. A big thank you to Barossa Carpet Court for sponsoring the day. Allan Hill, Rodney Egge, Ruth Scoot (Bowls SA), Ian Abraham, Barry Robran. Tom Ellis, Bruce Hall, Bob Ansebury. In a high standard finals series Phil Sanders from Salisbury BC managed to overcome Victor Harbour bowler Des Manuel in the final to take out the 2017 State Bowling Arm Singles title. In the semi-finals Phil defeated Colin Baker from Nuriootpa while Phil defeated Allan Hill from Tranmere. The Championships were conducted over 3 days from 9-11 April at the Tranmere Bowling Club and saw a record 34 players contest the event. This is now the 4th year that the championship has been held and the numbers have grown each year. Thanks to Tranmere Bowling Club for their continued support of arm bowler events. Winner Phil Sanders and Runner up Des Manual. ABA congratulates South Australia’s Arm Bowler State Singles Champion for 2016, Bill Richards of the Port McDonnell Bowling Club on his win. We also congratulate, Rob Corner from the Mt Gambier RSL Club as Runner Up. Is there something “in” that blue water!! Bill won his first Arm Bowler State Singles Championship in 2015 while he was playing for the Happy Valley Club in Adelaide. He moved to Mt Gambier and joined the Port McDonnell Bowling Club in 2016. His other achievements since using the bowling arm are: Happy Valley Club Singles 2014 and 2015 and Club Pairs 2015. Since joining the Port McDonnell Club, Bill has won the Men’s Triples, and the Mixed Pairs and he also won $500 in the Classic $2000 Pairs three-day event. Just recently he won the Turkey Triples at Casterton in Victoria. Bill says “I am enjoying playing with the arm but it still takes a lot of dedication to be consistent”. The first photo is of Bill Richards, the second is of Bill and Robert Corner from Mt Gambier, Winner and Runner up (resp.) of the Arm Bowler State Singles Championships of 2016. The third photo is Bill Richards and Heather Richards (not related) both of the Port McDonnell B. C., Mixed Pairs Champions for 2015-16. Heather is a friend and very well known for her achievements in women’s bowls in S.A. The fourth photo is of South Australia’s “first” ever Arm Bowler State Singles Champion (2014) and former State Organizer of Arm Bowlers, Leader of the State Side, Rodney Egge. 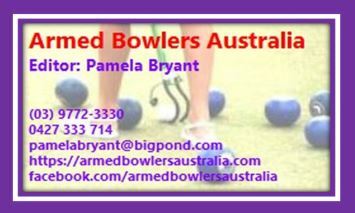 The Championships are open to every armed bowler in SA and are promoted to every club. Bowls SA provided the perpetual trophy but do not (yet) recognize this as an official State Event. It is run by the Bowling Arm Players Association of SA. Bill and Rodney will both compete in Q’ld in early Sept. ’16 in the National Challenge. National Bowling Arm Championships 7-9 Sep 2015. 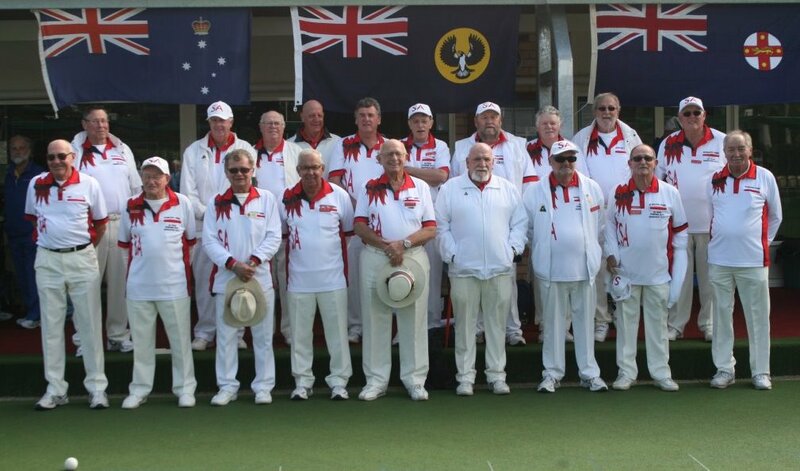 This years “National Bowling Arm Sides Championship” was held at the Tranmere Bowls Club situated 6 km east of Adelaide, South Australia. The Club boasts 3 “new” synthetic greens in a picturesque setting. South Australia were represented by: Ron Adam, Peter Amos, Brian Bagshaw, Colin Baker, Arch Baxter, Malcolm Borlase, Vince Daly, (SA Side Manager), Rodney Egge, Peter Faull, Rodney Haywood, Allan Hill, Johnny Ivanica, Rodney Knevitt, Phil May, Chris Prow, Stuart Reither, Bill Richards, Barry Robran, Don Sheldon.